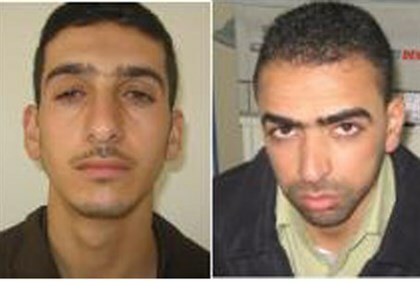 Marwan Kawasmeh (L), Amar Abu-Eisha…may their names be blotted…obliterated for all time…. IN this regard, it is almost never the case that the IDF and Israel’s attendant security services – with the Shin Bet/General Security Services/Shabak/ISA (Israel’s equivalent to the FBI) and Border Police’s special ops units in tow – fail to get the job done. In fact, you can likely count on both hands the times that they weren’t able to eliminate those they pursued. This should not be in doubt. HOWEVER, it is acutely true that Israel’s political leaders calculate that the DISPATCHERS of Hamas’s foot soldiers are, for the post part, off limits. As a matter of (egregious) record, though a few were assassinated during the summer-long’s fiery hot war, Hamas’s TOP leadership not only survived, but they became so emboldened that they are now dictating the terms of the (illegal) “ceasefire”. Absolutely. Unfathomably. MUCH of the war’s dastardly results can be gleaned in a major interview at Inquisitr. Excerpted below, in the second half of ISIS, Islam And Obama: Understanding The Threat To The Free World, are some bitter foretastes. More importantly, is this fair to the many thousands of Israelis who spend part of every day in bomb shelters? Adina Kutnicki: Your terminology, Israel’s “so-called” leaders, is decidedly on target. Bull’s eye……. Alas, with said backgrounder in mind, regarding the overall underpinnings of Israel’s leaders – both elected and non-elected – the prism of Israel’s latest “operation” comes into sharper relief. In fact, it was purposefully waged as a pinpointed “operation” and not as a war, and therein lies the end result. Indeed, PM Netanyahu’s personal (and national) onus. In the main, wars are fought with victory in mind, at least that’s what citizens have a right to expect. On the other side of the spectrum, an “operation”, by definition, is limited in scope. For heavens sake, even the wimpy name “Operation Protective Edge” bespeaks of its narrow and tepid focus. Truth be told, I would have coined it ” Mission Pulverizer” or some such variant thereof. Pray tell, when a regional foe has been rocketing your citizens for years, wouldn’t a more robust name have been appropriate? Some might query: what’s in a name? However, those of us who understand the peculiar jungle-like language of the Middle East – “strong horses rule” – realized what the name was meant to convey, even though it seemed bizarre to signal such (losing) intent to ones enemies. But never mind, Israel’s leaders are not “strategizing” under rational parameters…..
As to the strategic repercussions from not toppling Hamas in toto, well, they are manifest and very grave. First and foremost (even leaving aside the aforementioned deleterious psychological damage – many with attendant PTSD trauma symptoms – heaped upon the majority public, as well as the economic wreckage already accrued, plus future downturns investment-wise), regardless of any crowing from Israel’s top leaders, Hamas, by the very fact that they are in a position to dictate when missiles will fly, when they will stop and when a “cease-fire” will both commence and cease, that should tell most rational players who came out on top. Hint: not Israel’s blowhards, that’s for certain. Rest assured, this assessment is not meant to be flippant nor unduly harsh. It is just the way it is, irrespective of anything else. PC nonsense has no place in assessing life and death issues related to my Jewish homeland. Atop the above outrages, PM Netanyahu has reportedly agreed to revert back to the parameters of the last “cease-fire”. Said “negotiations” were executed after hard fought gains during “Operation Pillar of Cloud” in October 2012, but before the IDF could finish Hamas off! Déjà vu. Is this not a pattern of malfeasance? You decide…..
Minutes after a gag order was lifted, revealing that the IDF had eliminated her son’s murderers overnight, Rachel Frenkel (mother of murdered teen Naftali, hy”d) feels a sense of relief. Reactions from military officials and MKs have begun to pour in as well. “Our Army will continue to reach – and harm – terrorists, no matter where they are,” he added. MK Danny Danon (Likud) sent “a hug of condolence” to the three families, in his words. MK Alex Miller (Yisrael Beytenu) welcomed the elimination of the murderers of three boys. “The successful operation today is proof that there is no alternative to settling Judea and Samaria,” he added. The Jewish community of Hevron also welcomed the news. AND now with the start of a New Year, after many Jewish dead and maimed for life, one would like to believe that PM Netanyahu has learned some inherent truths. Nevertheless, those who are plugged in and on the top of the strategic totem pole understand that more of the same should be expected. YES, Israel’s political blowhards are likely patting themselves on their backs and behaving as if they executed said praiseworthy hits, simply because they gave the orders to do so. Truth dare be told, there was NO way they couldn’t have, being that the ENTIRE majority Zionist public – secular and religious – embraced the 3 murdered teens as their own. In fact, this blogger cried for days, just thinking about what happened to them. The Zionist public rallied around exacting justice on their behalf in a way which will stand out in Israel’s modern history. Alas, if others beg to differ, just ask yourselves: if Jewish justice was atop their lists, again, why are Hamas’s TOP leaders still breathing?? IN any case, thanks to Israel’s real vaunted heroes – embodying and restoring the essence of “Justice, Justice You Shall Pursue…Tzedek, Tzedek Tirdof” – this American-Israeli salutes their courage and authentic Zionist ethos. THE following is dedicated to them: https://www.youtube.com/watch?v=CQQIEQh8pU0 ! SHANA TOVA…a blessed New Year to all those who protect Zion! This entry was posted in Uncategorized and tagged Hamas kidnapped/murdered 3 Jewish teens, http://jewsdownunder.com/2014/09/24/idfshin-bet-eliminated-hamas-terrorists/, https://www.youtube.com/watch?v=4phXyzdsclg, https://www.youtube.com/watch?v=CQQIEQh8pU0, IDF eliminated murderers, Israel's appeasing political leaders, Shin Bet/General Security Services/Shabak/ISA, strategic "totem pole" understand:Dr. Martin Sherman, Understanding The Threat To The Free World by Adina Kutnicki. Bookmark the permalink.